Do you require different amounts of duplicate pages depending on your output? Or do you require a different amounts of duplicates depending on your output? Enfocus Switch can do just that—it makes it easy to automatically create duplicate versions of your single page PDF file! Are you currently sending out emails manually to let your customers know that you have received their file? 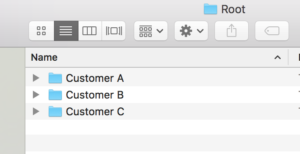 Do you have an FTP or Network folder where files are dropped into folders that have customer’s names? Enfocus Switch makes it easy to automate sending those email notifications. Enfocus Switch is compatible with Mac and Windows, and with its user friendly “workflow” builder, it will take you less than 30 minutes to create an automated email flow, giving you extra time to focus on new prospects and other work. Are You Looking For A Smarter Way to Build Your Enfocus Switch Workflow? 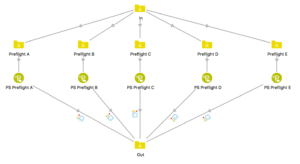 Do you have a Enfocus Switch workflow that looks like a circus tent or flying saucer due to so many options? 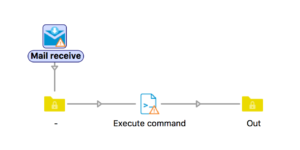 Do you wonder if there might be a way to use variables or smart preflight to simplify things? Are you looking for a smarter way to build your Enfocus Switch workflow? The XChange team can guide you in this process. 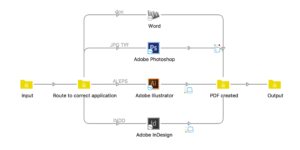 We can take a look at your current workflow and assist you in making your workflows smarter. Do you receive a lot of emails that contain an URL address to download a file? Are you currently going through every email, clicking on the link and picking a location to save the file? Wouldn’t it be great if you could automate that process and have your files directly saved into a folder on your system without any clicks? Enfocus Switch can do just that—it makes it easy to automatically download files from a URL address in your email! Enfocus Switch is compatible with Mac and Windows, and with its user friendly “workflow” builder, it will take you less than 30 minutes to create an automation flow to grab files from links, giving you extra time to focus on new prospects and other work. Many times, your PDF Preflighting results show objects that are not visible. The invisible objects will not even show up when printing the file. What if you had the option to ignore that type of objects during preflight and preflight only the necessary content of your PDF file? With Enfocus PitStop Pro and PitStop Server 2017, you can setup your profiles to preflight and distinguish objects that are needed to render or print a file and ignore those that are not. It is called the PDF Geomapper technology from Enfocus. Enfocus PitStop Pro and PitStop Server both include the industry-standard Enfocus preflight engine, which checks all aspects of your PDF files like detecting missing fonts, reporting incorrect colors and objects without bleed, to name a few examples. With Action Lists you can solve specific issues by remapping colors, embedding fonts, adding page numbers and more. PitStop Pro and PitStop Server are both Mac and Windows compatible. Are you receiving job orders through your website? Are you looking for a solution to process those jobs automatically? Do you have a print management information system (MIS) and you would like to produce print ready files automatically? Enfocus Switch is capable of processing web-to-print or MIS jobs automatically. You can rename or preflight your jobs corresponding to the job ticket info. Enfocus Switch is compatible with Mac and Windows and with its user friendly “workflow” builder, it will take you less than 30 minutes to create an automation flow that will give you extra time to focus on new prospects. Add Barcodes to Your PDF Documents Dynamically! Are you looking for a solution to add barcodes to your PDF documents dynamically? Would you like to know how to automate that solution? Enfocus Switch in combination with Enfocus PitStop Server can automatically add barcodes to your PDF documents. Enfocus Switch reads dynamic data and PitStop Server adds the dynamic data to your PDF document. What is needed for this example? And the good news is, it’s simple to set up and add barcodes to your PDF documents dynamically. Just follow along below! 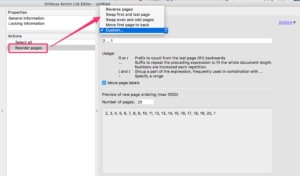 Re-ordering your PDF pages with Enfocus PitStop 2017! Are you spending a lot of time manually re-ordering your PDF pages for print? 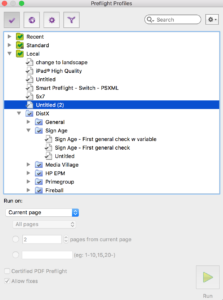 Do you need to get your PDF page order ready for imposition? You can now get these jobs done with Enfocus PitStop 2017 products. Enfocus PitStop is mostly used to produce print-ready PDF files and offers features such as changing RGB to CMYK, adjusting page size and adding color bars. With Enfocus PitStop 2017, you can re-order your PDF pages too, switching the first page with the last page for example. A new Action List called “Reorder pages” is now available in your Action List editor in Enfocus PitStop 2017 products. Convert Adobe Creative Cloud or Microsoft Office files to PDF – automatically! Spending a lot of time trying to convert Adobe Creative Cloud or Microsoft Office files to PDF? Or are you manually saving your files to low-res? Maybe you need your PDF file as a JPG file… Wouldn’t it be great if you could get this done automatically? Enfocus Switch could be doing the work to convert Adobe Creative Cloud or Microsoft Office files to PDF automatically for you. Enfocus Switch is compatible with Mac and Windows and with its user friendly “workflow” builder, it will take you less than 30 minutes to create an automation flow that will give you extra time to focus on new prospects. Enfocus QuickRun – Processing files with one click! Does your daily task list include opening your PDF file and selecting one or multiple Enfocus Presets? Or continuously trying to find those presets within the different windows and folders? How would you feel about getting your work done with one click? An Enfocus QuickRun will adjust your PDF files with one click. This preset is created within Enfocus PitStop Pro, a plug-in for Adobe Acrobat Standard or Professional and it is compatible with Mac and Windows.PitStop Pro is the industry-standard preflight engine that can check all aspects of your PDF files and pinpoints exactly where the problems are.